Bananas are full of fructose (fruit sugars), which gives your body a quick energy boost, while oats are a source of soluble fibre, which helps to reduce levels of 'bad' cholesterol. 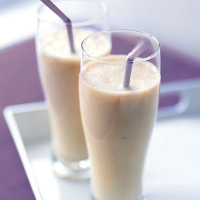 This smoothie is best made with really cold milk and served immediately, as the banana will discolour over time. Place the banana in a blender or food processor with the honey, oats and half the milk. Blend until the banana is smooth and thoroughly mixed with the milk. Pour the banana mixture into a large jug, add the remaining milk, stir well and divide between 2 glasses.